I hope you and yours are enjoying these holidays and are already well prepared for the new year. You have weathered the storms of 2010 so may 2011 bring you fair breezes and smooth sailing. But just in case, please prepare for a hurricane. Most of all I want you to be safe in this coming year. 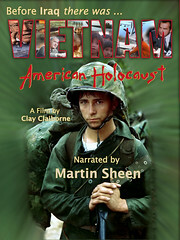 Our flagship film, Vietnam: American Holocaust was seen by far more people worldwide than ever before. One YouTube segment toped a half a million views this year. With worldwide over-the-air broadcasts on Russia Today TV and Free Speech TV, festival showings, on-line screenings, community and group expositions, bittorrent downloads and DVD sales through our own website, Amazon and others, the film is starting to have an impact on the dialogue about war and peace worldwide. Thanks to work of Nquyen Minh Y and Fred Nguyen we now have Vietnamese and French translations. And, yes we still sell through Amazon and accept donations through PayPal, even though I have been very strong in my support for WikiLeaks. I remember my father saying something about not cutting off your nose to spite your face. 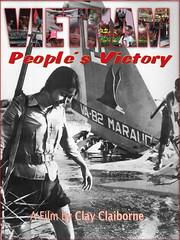 The sequel, Vietnam: People's Victory is in the heart of formation at this time. We have been able to make great progress on this documentary telling of how the Vietnamese won the war, with the support of the Peace movement and G.I. resistance, and showing the society they have built since. Finally the necessary updates to hardware and software are in place to handle the HD footage shot in Vietnam by Fred Nguyen and myself in 2009 and by Buddy Clark on a return trip in 2010. I am now happy to say that we are now editing with Adobe Premiere Pro CS5, on an quad core system with 8GB of ram. Our Linux server now has 9TB of space for the job. I am writing the screen play now as I assemble material for a rough cut, looking for the footage we still need, etc. The Vietnam War may seem like an old story to some, but somehow there is always "breaking news." For example, some of the WikiLeaks Cablegate memos go back as far as 1966 and we have yet to integrate those into our knowledge base. 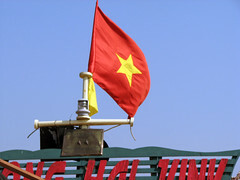 We are still on track to release Vietnam: People's Victory in 2011 but it will be more towards the end of the year. People who know my past know that I have a long history in the hacker community. I took Computer Science 101 in 1966. More to the point, I founded Linux Users Los Angeles in 1996 and was its president for 8 years. [LUG Pres Resigns Over Military Linux Use] I am proud to be considered an O.G. in the Linux community, which if you don't know it already, is pretty much the hacker community. I have partied with the Slashdot folks [Member of the 5 Digit UID Club] and the BlackHat crowd. I consider these hackers my people and I have been so proud and happy about the role my people have played in the world of political struggle this year! 2010 will be remember as the year that the hackers emerged as a powerful new social force and a good one at that. Julian Assange was a hacker, so was Bradley Manning. WikiLeaks is a product of the hacker community and it was that community that took an Anonymous shape to defend WikiLeaks. For every WikiLeaks site taken down, they put up a hundred mirrors. WikiLeaks stayed up and Mastercard.com went down! As the Obama adminstration struggled to put more controls on the Internet, a brand year form of class struggle was born and the Cyber Wars of the 21st century were begun! If you really want to dig into the WikiLeaks material, you don't have to wait to be spoon fed it by the likes of the NY Times or Washington Post. Just about all of the material they've release is available on the Internet as bittorrent downloads. Here are a few sources. thepiratesbay.org is the best place to search. This torrent will get you everything they've put out since June 12, 2010 except the cablegate memos. It's a very big download, about 20GB and might take you a few days but it is an amazing collection. This torrent will get you the first released cablegate memos [53MB]. This one will get you the Iraq War Logs [355MB] alone. This one will get you the Afghan War Dairy alone [152MB]. If you want to help protect WikiLeaks, here is the insurance file [1.4GB]. Here is the gun camera video "Collateral Murder". WikiRebels is a very good documentary on WikiLeaks. If you haven't seen it, it is well worth the watch. You can see it on-line here. The unredacted cablegate memos are also available if you know how to work with a git repository but you'll have to find a link to that on your own. Have fun prospecting! With so much material there are a lot more gems to be found.